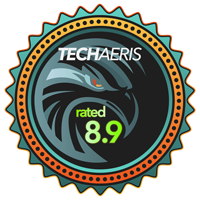 If you’ve followed us here at Techaeris for any length of time, you know a few of us are avid gamers and love our mechanical keyboards. There are definitely plenty of choices out there, most of the wired variety. One thing you don’t want to be experiencing while gaming is latency and that’s why gamers usually choose wired peripherals like keyboards, mice, and controllers. Wireless controllers have been around for years on consoles and reliable wireless peripherals have also been making their way to PC gaming. 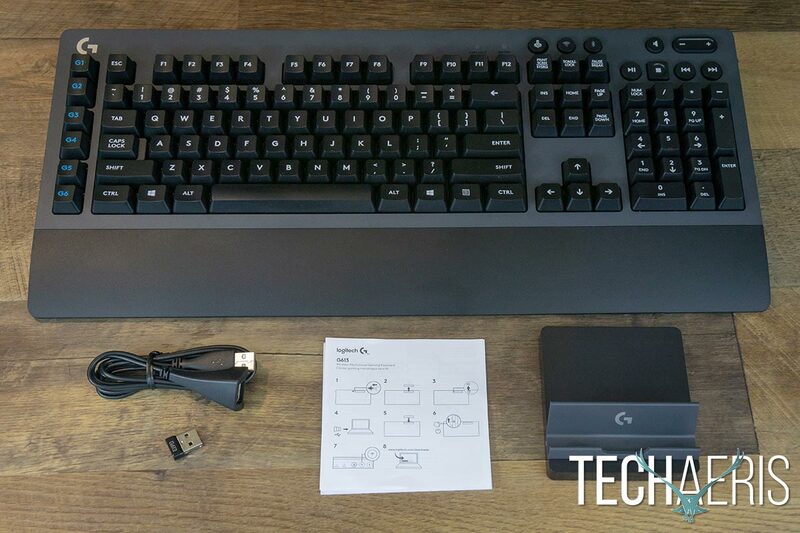 Our Logitech G613 review takes a look at a wireless mechanical gaming keyboard with Romer-G key switches which connects to your computer via Bluetooth or the LIGHTSPEED USB dongle. 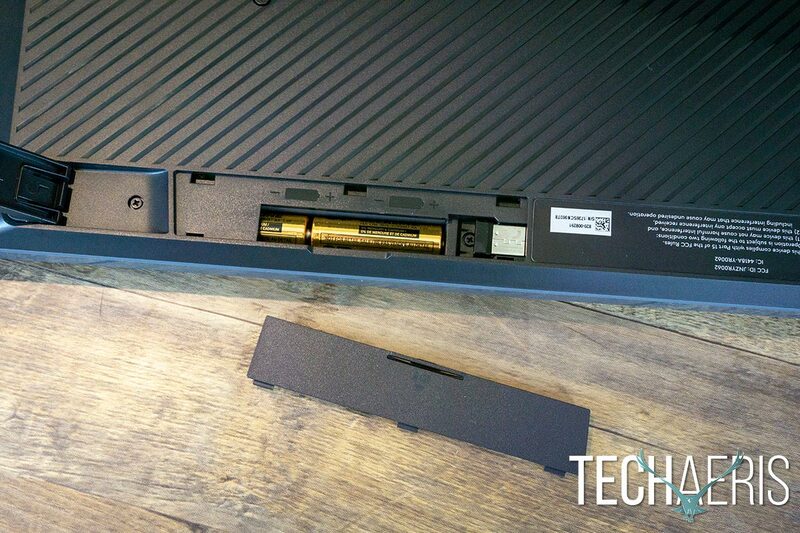 Read on to find out if it can meet the demands of low latency keystrokes for gaming. NOTE: If you’re looking for a wireless gaming mouse, we’ve also posted our review of the Logitech G603 LIGHTSPEED Wireless Gaming Mouse. Generally speaking, desktop keyboards have very similar layouts. 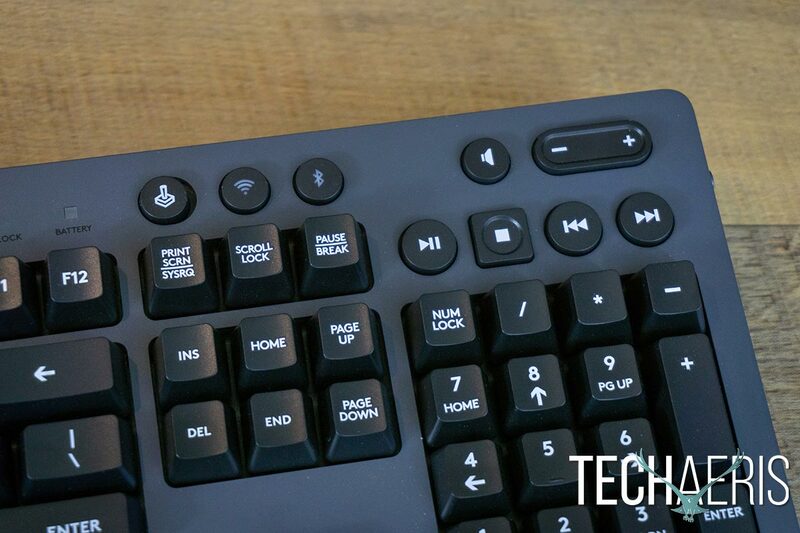 The Logitech G613 isn’t much different and boasts the usually 6-row layout with the four arrow keys set below the Ins/Del key grouping with a full-sized number pad off to the left. Where it does differ from some other keyboards is the addition of six programmable macro keys on the far left labelled G1 through G6. The Caps Lock indicator light sits above the F11 key while the battery indicator sits above the F12 key. Interestingly enough, there is no Num Lock or Scroll Lock light anywhere on the keyboard which is a pretty big omission — especially in the case of the Num Lock indicator. There are six “G” keys which can be customized with macros or other shortcuts. Above the Print Screen/Scroll Lock/Pause keys are three low profile round buttons. 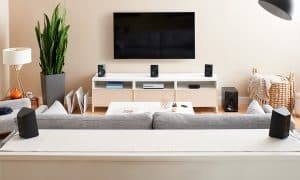 The first is a game mode switch while the other two are wireless and Bluetooth buttons which can be pressed to toggle wireless or Bluetooth modes. Above the number pad are four low profile media keys with an equally low profile mute button and elongated volume control button. I’m not sure if it’s the lower profile of these buttons, but while nice to have, they do feel a bit on the cheap side but it could just be the finish style on them. The game mode switch, wireless, BT, and media control buttons. 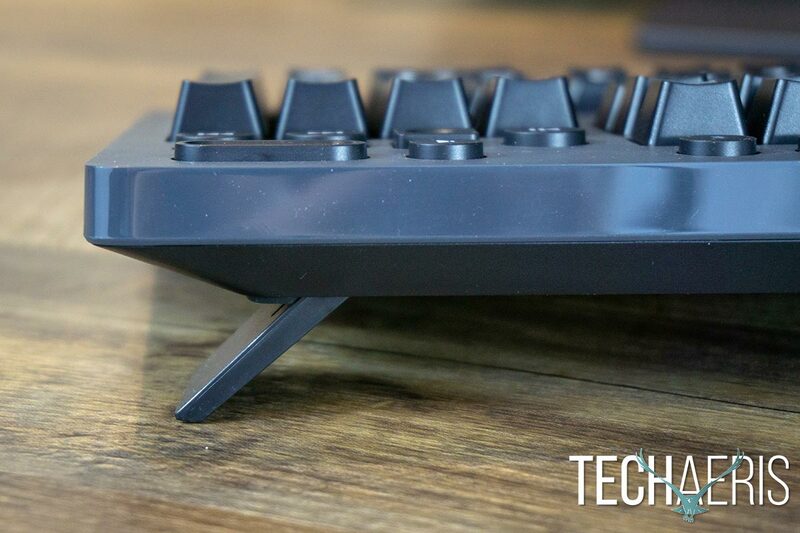 Even though the keyboard weighs just over three pounds, it does have a lighter weight feeling construction than other mechanical keyboards that I’ve recently reviewed. That’s not necessarily a bad thing but it looks pretty much like a standard keyboard with a few extra buttons and nothing really design wise to set itself apart. The main frame of the keyboard is a dark gray with black keys and a molded black wrist rest at the bottom. Unfortunately, the wrist rest isn’t removable so if you’re one who prefers a keyboard without, you’ll be stuck with it in this case. The Logitech G logo is printed above the macro keys on the left side in silver. Located on the right edge near the top is an on/off switch for further battery conservation with G613 printed in silver to the left of it. 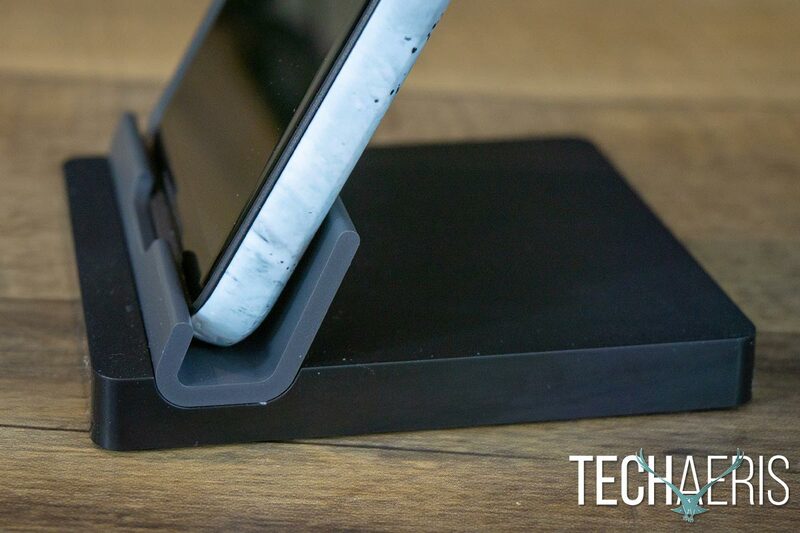 Conserve battery life with the on/off switch. Flip the keyboard over and you’ll find the usual adjustable feet which provide two height levels of use and the battery compartment for the two AA batteries required to power the keyboard. Adjustable feet for two height modes. The Logitech G613 Wireless Mechanical Gaming Keyboard can be used in two ways: over wireless USB or via Bluetooth. On the wireless USB side, Logitech uses a “pro-grade wireless” technology they developed called LIGHTSPEED, which we’ll talk about more in the Performance section. To the end user, it’s no different setting up than any other wireless keyboard. Simply plug in the wireless USB dongle, turn the keyboard on, and you’re good to go. 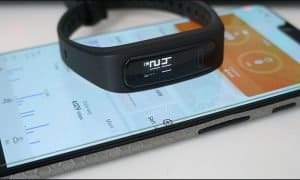 Alternately, you can connect to your computer or other Bluetooth-enabled devices by pressing the Bluetooth button on the keyboard and pairing it with your smartphone or another device. 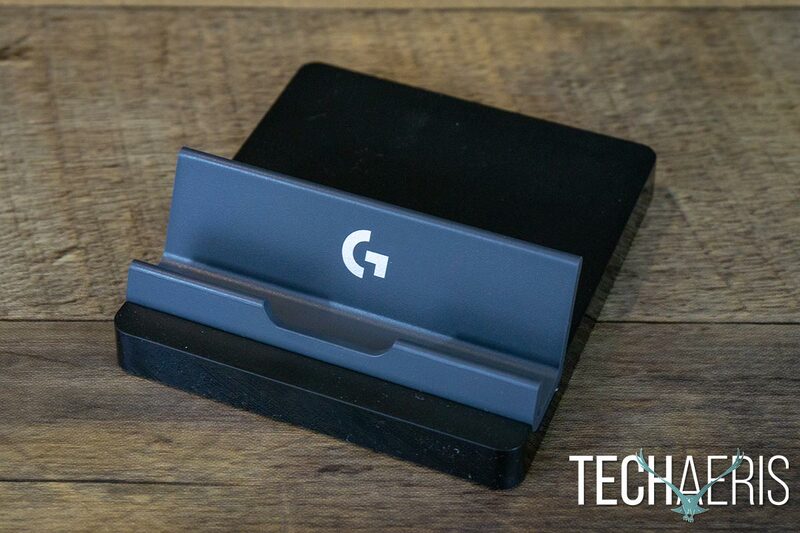 You may have been wondering why Logitech included a smartphone stand with the keyboard, but after pairing the keyboard to the Google Pixel 2 XL, I can see why. It was actually pretty cool to be able to switch effortlessly back and forth between typing on the computer and the phone with a press of a button. The phone stand worked great with the Pixel 2 XL in a case and made it easy to type with the keyboard on it via Bluetooth. Of course, you can use the keyboard as is but Logitech also has the Logitech Gaming Software (LGS) which allows you to assign macros or other functions to the six programmable macro keys. Programming the six macro keys is pretty easy, simply select the macro key and then enter in your keystroke(s), text block, mouse function, shortcut, hotkey, function, or even Ventrilo command. While it’s somewhat straightforward, the process could be a bit clearer, especially for those inexperienced with creating macros and the like. 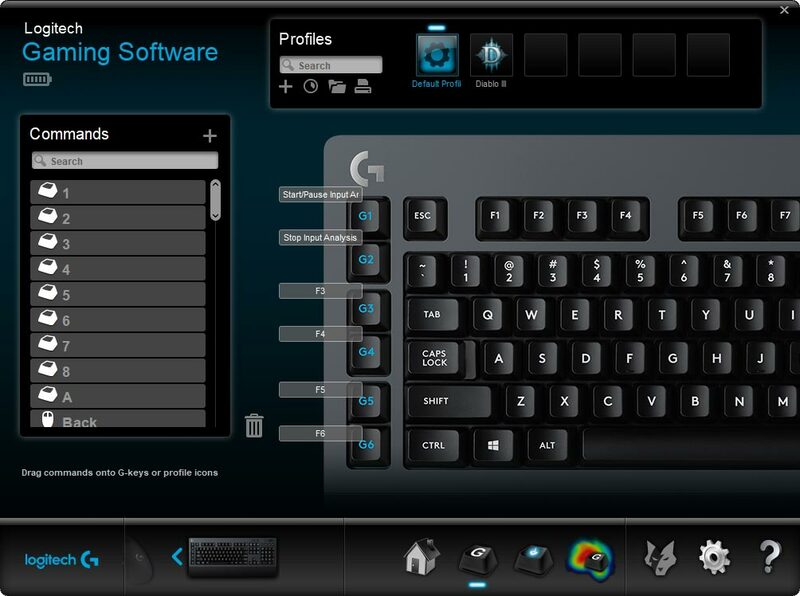 Logitech Gaming Software Macros screen. You can also easily set per game gaming profiles and lockout specific keys from interfering with your gameplay, such as the Windows key. In fact, if you wanted to, you can lock out every key except the ones you need to play that specific game. A fun feature of LGS allows you to track keystrokes and display them as one of two heat maps: a Key Press Heat Map and a Key Duration Heat Map. Both allow you to toggle a weighted center as well, so you can see where your keypress tendencies lie during gameplay or even just typing in general. The Key Press Heat Map also shows your KPM score, as well as the number of times you hit each colour code keys, while the Key Duration Heat Map also shows the total amount of time you spent pressing a particular colour of key on average. 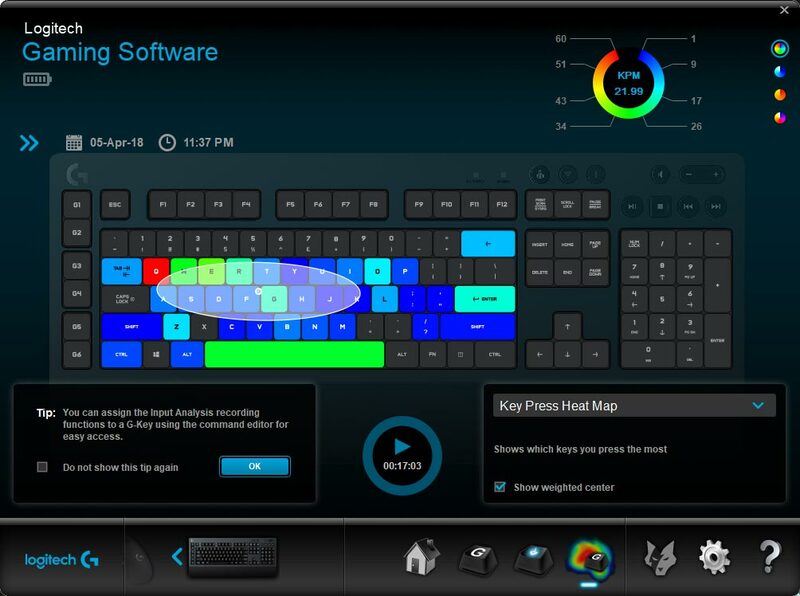 Logitech Gaming Software Heat Map results. Finally, you can also set the polling rate on the keyboard and update the firmware as well as control other settings like notifications and the like. Logitech hardware is also supported by Overwolf (we didn’t install or test it out though) and there is an icon in LGS to install it. Of course, the big question is this: can a wireless mechanical gaming keyboard keep pace with a wired one? First, let’s start off with general performance. 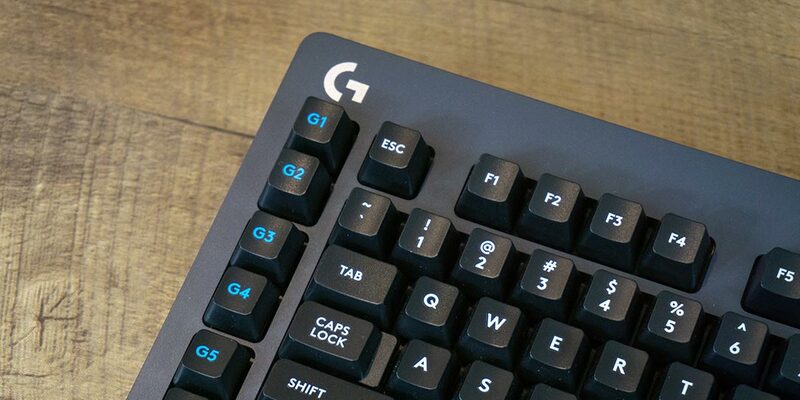 The Logitech G613 keyboard uses Logitech’s Romer-G switches. With a 45g actuation force, they are akin to Cherry MX Brown switches. However, the Romer-Gs have a “short-throw” actuation which actually registers at 1.5mm, making them a very responsive, and quiet, mechanical switch. During typing or gaming, I had no issues with lost keystrokes and the switches registered quickly and as one would expect from a gaming keyboard. 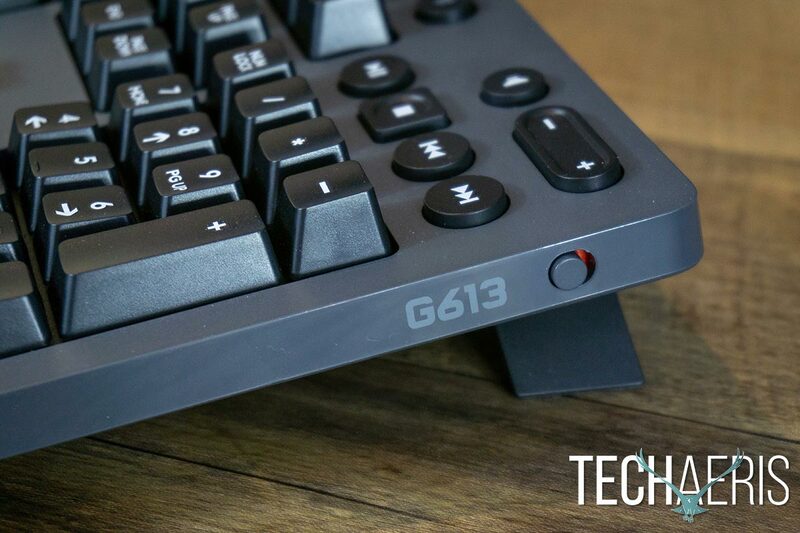 The G613 is definitely on the quieter side of the spectrum for mechanical keyboards as well. For years, gamers have favoured wired connections as it has — at least in the past — been faster than wireless ones. As mentioned in the opening paragraph, wireless gaming peripherals are slowly gaining ground for a number of reasons, the biggest being the lack of messy wires everywhere. In the case of the Logitech G613, the Logitech LIGHTSPEED technology claims to be even faster than some wired counterparts with its 1ms reporting rate. To be honest, I personally didn’t see any difference between the response time between the G613 and any of the wired mechanical keyboards I recently reviewed. In other words, the Logitech G613 Wireless Mechanical Gaming Keyboard is just as responsive for gaming and general typing as a wired keyboard. There was one instance while testing over a period of a couple months where the keyboard flaked out mid-game. During a round of Heroes of the Storm, I could still type in chat but the keyboard didn’t seem to want to work very well for trait commands which, if you play Heroes, basically makes you non-effective. Because it was mid-match I quickly swapped out for a wired keyboard to finish the match. Once done, I removed the batteries from the keyboard and reinserted them and I haven’t seen the issue arise since. There has also been a firmware update since that incident so it’s possible it was a one-time occurrence or it was an issue that was resolved with the update. Aside from that, I’ve had no real issue with performance issues from this keyboard while gaming or during general use. If you do have issues with the G613 connecting to your computer due to your setup (desktop computer under your desk for example), you can always use the included extender USB cable to move the USB receiver closer to the keyboard. Logitech claims a battery life of 18 months when using over the wireless LIGHTSPEED connection. We certainly haven’t had a chance to test this out but after a couple months of continuous use for a few hours a day the keyboard is definitely showing no signs of slowing down. In addition, the keyboard uses AA batteries so it’s simple and affordable to swap out the batteries. I’d definitely keep a second pair on hand in case the keyboard should die mid-game but there is a battery indicator light that should warn you far in advance of that happening. Logitech claims a battery life of 18 months on two AA batteries. The Logitech G613 has an MSRP of $149.99 USD. Personally, I think that’s a bit high for this keyboard. Granted, it is wireless, supports Bluetooth, and does feature mechanical key switches but there are plenty of wired mechanical keyboards that are much more affordable. 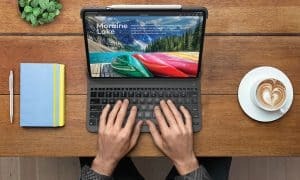 I’d like to see this keyboard priced around the $100USD mark to make it a great value at that price. Fortunately, it’s currently on sale for $98.50 on Amazon which, given the design and feel of the keyboard, is a much better price. 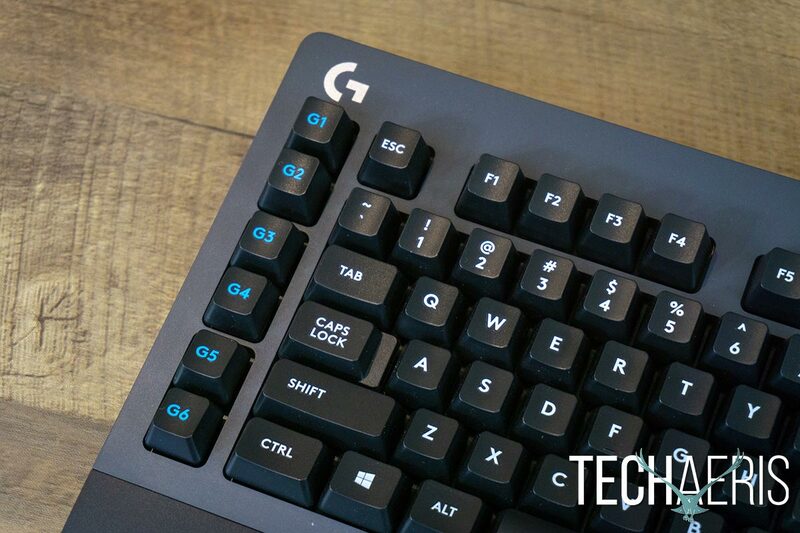 Performance-wise, the Logitech G613 Wireless Mechanical Gaming Keyboard performs as well as, if not better than, some of its wired counterparts. Unfortunately, the design is rather bland and it looks like a cheaper, standard keyboard as opposed to the gaming peripheral it is. *We were sent a sample of the Logitech G613 Wireless Mechanical Gaming Keyboard for the purposes of this review.